Every day for the last year I’ve walked the same path, about a mile each way, to drop off and pick up my daughter. I’ve adopted this swath as my personal transect: I’m learning the names of all the trees and make a point of trying to spot the birds that I hear (often it’s Josephine that hears them first and says, “bioyd!”). This also given me the chance to watch how the seasonal change moves over my little San Franciscan hill. 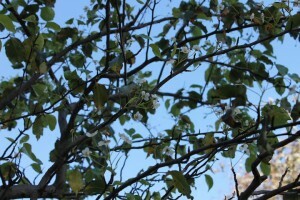 Right now it’s very cold – low 40s even a little frost sometimes – and yet trees are blooming. Particularly strange are the evergreen pears, which come from across the Pacific: China and Japan (they don’t make pears and they are only evergreen where it doesn’t freeze). 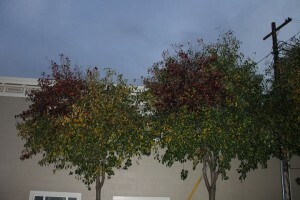 They began blooming before Christmas (which seems to be normal for the Bay Area).What’s strange is that cousins of this tree at the top of my transect are blooming at the same time that their leaves are turning an autumnal red (these may be Callary pears). And it’s just a patch turning red – as if it were a grafting. Does this have something to do with the exposure to a cold column of air? Is it something like a graft? If you look very closely you can see the blossoms against the red.